Today, with the ever growing need to conceal weapons due to security issues, business owners and people like you are discovering more ways of concealing their guns to avoid raising public attention. There are various ways one can rely on to conceal carry their weapons. 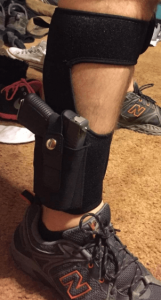 Although all the other methods are perfect, most people are considering using ankle holsters for concealed carry due to their safety features and ease of use. Now that you’ve decided on the right holster method to consider, now the real hassle comes in when choosing the right ankle holster that will not only keep you comfortable, but will also make it easier for you to retrieve your gun during an emergency. Below are some factors you need to consider when choosing the right ankle holster. 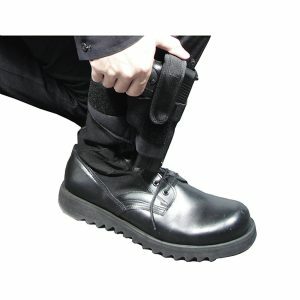 The material – the material of any ankle holster must be made in such a way that it offers maximum comfort to the user. Since ankle holsters are worn underneath clothing, they need to have that aesthetic appeal as slight discomfort can have a deep effect on the performance of the holster. One of the best materials to consider for ankle holsters is neoprene fabric. Safety – another key factor you need to consider is the safety of your weapon. The best ankle holster should be tight and capable of restricting the movement of the trigger. Concealment – finally, when purchasing an ankle holster, you need to check whether it fits your ankle well without exposing your weapon. The best ankle holster should perfectly fit around your ankle while maintaining a low profile to eliminate any possible suspense. Having said much about ankle holsters, this guide will now review five of the best ankle holsters available in the market today. Before that, allow me to mention that ankle holsters are easy to wear and are not cumbersome like most other conceal carry methods. Accessing your weapon is also very easy as it entails bending over to pretend you’re tying your shoes. The Concealed Carrier Ankle Holster is one of the best holsters made from high quality surgical grade elastic neoprene fabric. Whether using it as a primary or a secondary conceal option, this holster makes it easier for you to keep or draw your handgun easily without any resistance. What makes this holster the best is due to the fabric used. The neoprene material used in the construction is well ventilated to avoid any sweating while the thick foaming on the inside prevents rubbing which can cause discomforts when walking, jumping or working out. The Concealed Carrier Ankle Holster is elastic and can support any firearm ranging from the small sub-compact Glock 27 all the way to the full size .45 1911. Click here for current price and reviews. Maximum comfort – one feature that makes a good holster is comfort. The Concealed Carrier Ankle Holster has passed this test thanks to the neoprene fabric used in the construction. This fabric is well aerated and is perfectly foamed to keep your ankle comfortable when walking or running. Quick draw guarantee – another feature we appreciated with this holster is the quick draw guarantee. This feature allows you to easily flick the retention strap to draw your weapon easily in case of an emergency. Flexible – finally, this holster is very flexible as compared to most other brands thanks to the neoprene fabric. The manufacturer has designed this holster with universal features to make it capable of accommodating a variety of guns from sub-compact Glock 27 to the full size .45 1911. This holster is flexible and capable of holding a variety of different guns. This holster is very easy to draw thanks to the retention strap. The neoprene fabric used in the construction is breathable and very comfortable. This holster is durable and long lasting. This holster is comfortable but the Velcro fails to hold after some time. The mag pouch is too close to the firearm making it uncomfortable when the two rub together. In conclusion, let me say that the Concealed Carrier Ankle Holster is among the best holsters available in the market. Made from pure neoprene fabric, this holster is flexible, tough and long lasting. This holster is capable of holding both small and large handguns and the overall performance is just superb thanks to the overall rating of 4.7/5. The Lirisy Ankle Holster for Concealed Carry is another high quality holster that does its job pretty well. Made from breathable neoprene material, this holster is comfortable to wear both on the right and left ankle. 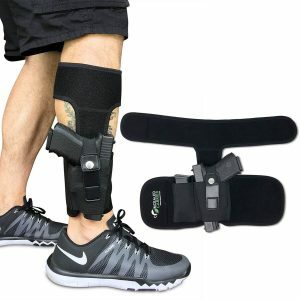 To ensure that this holster provide maximum comfort to the user, the manufacturer has added thick foam padding on the inside to protect your ankle against rubbing or poking that might occur when running. The Lirisy Ankle Holster for Concealed Carry is available in two sizes that include; the 15” band and the 17” band that fits both 13” and 15” leg sizes. This holster is universal and is capable of supporting a wide range of guns from micro pistols to sub-compact, compact and revolver guns. Comfortable design – the Lirisy Ankle Holster is designed with a breathable neoprene fabric that makes it easier to wear, run or work out without injuring your ankle. A special padding has been used on the inside to prevent any possible rubbing, poking or pinching. Universal – another outstanding feature with this holster is the ability to fit a wide range of guns. According to the manufacturer, this holster has the capacity to fit compact or sub-compact guns such as the Ruger LCP 380, Sig P238, Kimbler Solo and Glock 26 among others. This holster is breathable and very comfortable. The neoprene fabric used is durable and capable of withstanding the test of time. This holster is universal and capable of supporting a variety of different guns. 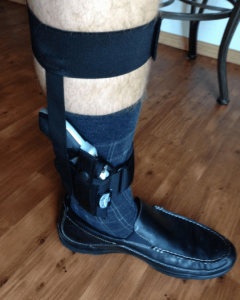 This holster can be rotated from left to right side of your ankle. At the first few uses this holster is tight, making it difficult for you to insert your weapon. Overall, we were pleased with this holster thanks to the neoprene fabric used in the construction. Majority of the customers have appreciated how easy it is to draw a gun and how comfortable the inner foam holds against your ankle. 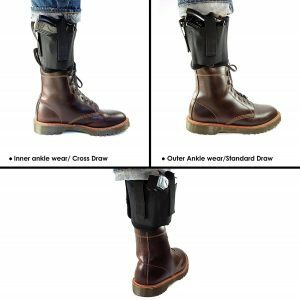 The Lirisy Ankle Holster for Concealed Carry is available in two sizes—15” and 17”—and is capable of fitting 13” in diameter legs and 15” legs as well. Welcomed with a 4.6/5 star rating from most online customers, the Lirisy Ankle Holster for Concealed Carry is one of the best ankle holsters to consider in 2017. The next ankle holster we’re going to review is an ankle holster with a magazine. Also made from breathable neoprene fabric, this holster is designed with small micro holes that prevent excessive sweating when wearing in hot seasons. Just like the other holsters in this guide, this too is designed with a special foam padding that protects your ankle from any friction when walking or running. The ankle holster is designed with a one size fits all. This holster measures 19” length by 5” wide making it highly adjustable and capable of fitting users of all sizes. Finally, this holster is designed to hold guns of various sizes and shapes such as the Ruger LCP 380, Kimber solo, Sig P238 and Glock 26, 27, 30, 42, 43, xds 45 and many more. Highly versatile – one feature that drives every customer to purchase this holster is the versatility. Similar to most other holsters, this one is designed with an elastic fabric that fits most guns ranging from the compact pistols all the way to the subcompact and revolver pistols. Very comfortable – made from neoprene fabric, this holster is breathable and very comfortable. The neoprene material used in the construction features small micro holes that prevent excessive sweating. In addition to that, the interior is designed with foam pads that protect your legs against any possible friction or discomfort. The holster is made from a superior high quality fabric. There is an extra pouch where users can keep extra mags. This holster can be worn both on the left or right ankle. This holster is compatible with a variety of different guns. The Velcro closure fails to secure the holster after several months of use. Overall, the Ankle Holster For Concealedn Carry is one of the best concealed carry holsters that protects your gun against public eyes. This holster is compact and perfect for most leg diameters thanks to the neoprene fabric. Majority of the customers who’ve used this holster have praised how easy it is to draw your weapon without messing anything up. Although some customers have complained about the poor Velcro performance, this holster is also one of the best to consider when concealing your weapon. Next in this guide, we reviewed the UTG Concealed Ankle Holster. Made from a heavy duty soft fabric, this holster is secure and safe to conceal your weapon when walking or running. This holster is designed with a special padded wraparound strap that features hook and loop closures to securely keep your weapon intact from any uncertainty. Although the UTG Concealed Ankle Holster is designed for conceal carry purposes, airsoft hobbyists can take advantage of this holster as a backup gun. Finally, this holster is designed with additional calf straps and security straps to secure your weapon during those tight situations. Fully adjustable - the UTG Concealed Ankle Holster is designed with adjustable calf straps and double vertical security straps to keep your weapon intact and perfectly secured when running or walking around. Highly comfortable - another feature that lures most customers to purchase this holster is the level of comfort it offers. Quite similar to most other holsters, the UTG Concealed Ankle Holster features a padded wraparound strap that keeps your ankle comfortable when walking. This holster offer users a high level of comfort when wearing. This holster holds your weapon tightly to hide it from any suspense. This holster is versatile and capable of holding a variety of different guns. The UTG Concealed Ankle Holster is heavy duty and capable of withstanding the test of time. This holster is not as tight as you would have expected. The Velcro closure is not long lasting. It becomes lose and unable to hold your weapon after some months of use. Overall, the UTG Concealed Ankle Holster is an affordable conceal carry holster that secures your weapon at the ankle area. Made from a breathable elastic fabric, this holster is capable of keeping your ankle safe when running, exercising or walking around. Most customers have appreciated the hook and loop closures which keep the holster perfectly secured incase of any uncertainty. Welcomed with a 3.8/5 star rating from most online customers, the UTG Concealed Ankle Holster is the best option for customers looking for an affordable ankle holster. The final holster we’ve reviewed in this post is the Uncle Mike’s Off-Duty and Concealment Kodra Nylon Holster. Made entirely from Kodra (a ballistic nylon material), this holster has good abrasion, resistance and softer texture that secures your ankle from any possible friction. The Uncle Mike’s Off-Duty and Concealment Kodra Nylon Holster is designed to conceal both small and medium sized weapons. The hook and loop adjustment is just outstanding as it makes it easier for you to draw your gun without facing any difficulty. Finally, this holster is designed with special waterproof foam that secures your ankle without absorbing sweat. Highly comfortable – one feature most users appreciated with this holster is the level of comfort. Made from Kodra material, this holster is well padded and the best option for those users who walk a lot. Versatile – something else we enjoyed about this holster is how versatile it is especially when it comes to handling various guns. Most customers have appreciated how this holster conceals different gun sizes ranging from small to medium sizes guns. The Uncle Mike’s Off-Duty and Concealment Kodra Nylon Holster is available at an affordable price. This holster conceals both small and medium sized weapons. The adjustable hook and loop design makes it easier for you to draw a gun during emergency situations. 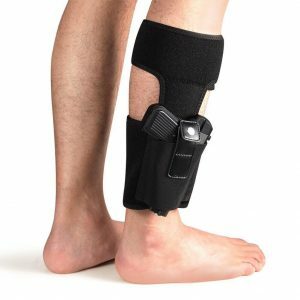 The special padding on this holster provides more comfort to your ankle when walking. The holster can lose its elasticity if you walk for too long. Last but not least, the Uncle Mike’s Off-Duty and Concealment Kodra Nylon Holster is one of best holsters that conceal your gun against any public eyes. Made from Kodra Nylon fabrics, this holster is very comfortable and capable of keeping your ankle secure from any possible friction when walking or running. Although some customers have complained about some setbacks, the overall performance of this holster is just outstanding. From our review we have found that the best ankle holster is the Lirisy. It's the best holster for the money.